The xGen® Exome Research Panel v1.0 is for the analysis of the human exome via next-generation sequencing. A total of 429,826 probes span 39 Mb of the human genome, providing deep and uniform coverage of 19,396 genes. 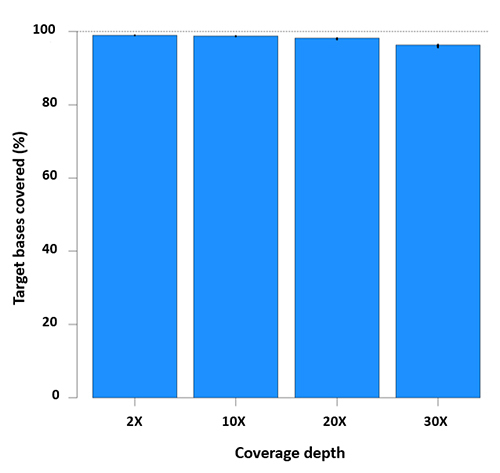 Using the xGen Exome Research Panel with xGen Lockdown® Reagents and the optimized protocol, scientists should be able to obtain reliable and reproducible exome data in a single day, saving further time by minimizing the need for added downstream analysis. Each probe within the xGen Exome Research Panel is individually synthesized, and undergoes a rigorous manufacturing and quality assessment process in accordance with GMP standards. Batch-to-batch variation is also minimized, ensuring uniform coverage and consistent results between panels.